People with lucky Number 6 have a strong sense of responsibility. They are idealistic and must feel useful to be happy. The main contribution they make is that of advice, service and ever present support. This is the lucky Number related to leadership by example and assumption of responsibility, thus, it is their obligation to pick up the burden and always be ready to help. The lucky Number 6 is one who is compelled to function with strength and compassion, a sympathetic and kind person, generous with personal and material resources. Wisdom, balance, and understanding are the cornerstones of this lucky Number. Their extraordinary wisdom and the ability to understand the problems of others is apt to commence from an early age allowing them to easily span the generation gap and assume an important role in life early on. While the 6 may assume huge responsibilities in the community, the life revolves around the immediate home and family, for this is the most domestic of numbers. Most with lucky Number 6 are the positive types who willingly carry far more than their fair share of the load and are always there when needed. they are very human and realistic about life, and they feel that the most important thing in their life is the home, family and friends. The number 6 lucky Number actually produces few negative examples, but there are some pitfalls peculiar to the path. Avoid the tendency to become overwhelmed by responsibilities and a slave to others. Also, avoid being too critical (of self or of others). 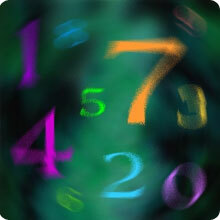 The misuse of this lucky Number produces tendencies towards exaggeration, over-expansiveness, and self-righteousness. Imposing one's views in an interfering or meddling way must be an issue of concern. The natural burdens of this number are heavy, and on rare occasions, responsibility is abdicated by persons with this lucky Number 6. This rejection of responsibility will make them feel very guilty and uneasy, and it will have very damaging effects upon their relationships with others.